Biology is the scientific discipline that studies life processes or characteristics of living organisms, including their structure, function, growth, origin, distribution and evolution. The word Biology comes from the Greek word bios meaning "life", and logy which basically means "the study of". Biological creationism is the doctrine or belief that various kinds of living beings were created and so are not the product of a naturalistic process. The creator is usually identified as God. It is, therefore, philosophically opposed to evolutionism. As the theory of evolution is found as an integral part of all secular biology, it is critical that creationists have a thorough understanding of this scientific discipline. Creation biology is the study of biological processes and organisms, while operating under the assumption that God created life on Earth. The discipline is premised on the idea that God created a finite number of discrete created kinds or baramin. While these forms of life have the ability to vary and even undergo speciation, they cannot arise spontaneously from non-life, cannot interbreed outside of their kind, and cannot increase in genetic complexity. Creation biology therefore differs from evolutionary biology primarily in its assertion that the cell is intelligently designed, and that other aspects of the theory of evolution regarding abiogenesis and common descent are false. Advocates of the creation accept all demonstrable facts in physiology, cell structure, the genomic basis of life, and speciation. Biological scientists study living organisms and their relationship to the environment. They investigate origins, developmental processes, anatomy, physiology, and other basic principles of plant and animal life. Occupations involve conducting research into the biological, chemical and physical reactions that occur in life processes. Scientists may be designated according to speciality as: Bioanalysts, Biochemists, Ecologists, Herpetologists, Ichthyologists, or Marine Biologists. Cell biologist working with cultures in a protective hood. 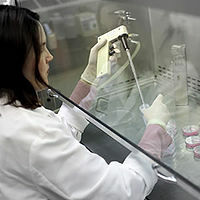 Many biological scientists work in research and development. They perform research to gain a better understanding of fundamental life processes or apply that understanding to developing new products or processes. Some conduct basic research to advance our knowledge of living organisms, including bacteria and other infectious agents. Basic biological research enhances our understanding so that we can develop solutions to human health problems and improve the natural environment. These biological scientists mostly work in government, university, or private industry laboratories, often exploring new areas of research. Many expand on specialized research they started in graduate school. Most biologists specialize in one area of biology, such as zoology (the study of animals) or microbiology (the study of microscopic organisms). Botanists—-Study development and life processes, physiology, heredity, environment, distribution, anatomy, morphology (structure and form), and economic value of plants for application in such fields as agronomy, forestry, horticulture, and pharmacology. 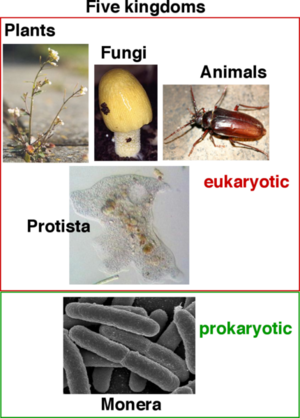 Geneticists—-Study inheritance and variation of characteristics in forms of life. Perform experiments to determine environmental factors in origin, transmission, and development of inherited traits. Zoologists—-Study origin, interrelationships, life histories, habits, life processes, diseases, relation to environment, growth, genetics, and distribution of animals. Created kinds or Baraminology: the idea that life was originally created in a finite number of discrete "kinds" or "baramin", and that while these kinds had the ability to vary significantly within their kind, one kind cannot interbreed with another kind, and new kinds cannot arise spontaneously. This runs contrary to evolutionary biology's account of universal common ancestry and its phylogenetic tree, that is, that all life on the planet is related via macroevolution. Teleology: the idea that the universe and life has been designed for a purpose. This runs contrary to the view that there is no objective purpose in the universe. Biogenesis: the assertion that naturalistic speculations about the origin of life such as abiogenesis are false, because life was designed and created already fully formed. It is argued that no comprehensive explanation has emerged for life arising spontaneously from non-life. Since life has never been observed arising spontaneously from non-life, it is more reasonable to assert life was designed by an intelligent being. This challenges the view that life arose spontaneously from non-life. Irreducible complexity: the idea that some systems in life that could not have formed through gradual change, because they are composed of interdependent components where the absence of one would cause the entire system to fail, so that the entire system must have originated together. Advocates of irreducible complexity claim that it is therefore more reasonable to believe they were designed and assembled together for a purpose. This runs contrary to the views of evolutionary biologists who assert that life evolved and diversified step by step over millions of years. Specified complexity, that is, the claim made by William Dembski, a mathematician and senior fellow of the Discovery Institute, that genetic information is "complex specified information" (CSI), that natural processes can reduce and change CSI, but can never increase it, and that it is therefore more reasonable to infer that such information was created through the intervention of an intelligent designer rather than being the sole product of evolutionary processes. Genetic recombination: growing evidence that the bulk of variation is not due to random mutation of genetic material, but recombination events which are not random, but instead managed and controlled by cellular mechanisms. Genetic drift: Genetic drift reduces diversity in populations more quickly than mutation can introduce it. This results in a net decrease in genetic diversity over time, a fact inconsistent with evolution but consistent with creation. Fossil record: The fossil record shows inadequate transitional forms to support belief in the common descent of all life on Earth. Paleobotany: Sedimentary rocks show pollen in very deep, "Precambrian" strata. This fact is inconsistent with mainstream uniformitarian geology, which holds that flowering plants had not yet evolved when the precambrian strata were being laid down. It is consistent with flood geology, however, which holds that the strata are the result of rapid catastrophe during the Great flood, and thus predicts fully developed flowering plants appearing at many places in the fossil record. Paleozoology: Paleozoology (from Greek: paleon--old, zoon--animal) is the study of creatures found within the fossil record. Rapid Evolution in Real Time On islands off the coast of Florida, scientists uncover swift adaptive changes among Carolina anole populations, whose habitats were disturbed by the introduction of another lizard species. The Scientist, October 23, 2014. Evolution Is Not Random (At Least, Not Totally) Mutation hotspots and preserved regions of DNA reveal that changes are not the nonrandom processes that were originally assumed. Live Science, October 02, 2014. Two Genetic Codes Are Better Than One An “overlapping language” has been found in the genetic code. Creation Evolution Headlines, December 30, 2013. Scientists Explore The Pure Geometry Inside Our Cells A new study has mapped the geometry of one of the cell’s key components: the endoplasmic reticulum. Forbes, July 24, 2013. Secret of the intricate pattern of cauliflowers unlocked and described with maths Scientists hope the insight will help them learn about the biological and physical mechanisms involved in the growth of the vegetables. Daily Mail, October 23, 2012. ↑ 1.0 1.1 Biological and Life Scientists by the U.S. Bureau of Labor Statistics. ↑ Occupational Outlook Handbook, 2008-09: Biological Scientists by the U.S. Bureau of Labor Statistics. Biology Text Addenda Evolution supplements for popular Biology textbooks. This page was last modified on 14 August 2015, at 21:18.